If you have grown pumpkins and squash in your polytunnel then these will now be ready for harvest. Winter squash and pumpkins will keep well over winter, providing you with a source of food during the leaner parts of the year. Don’t be tempted to carve all your pumpkins and squash for Halloween. Instead, think about how these can be kept for food over the coming months. When harvesting pumpkins and winter squash from your polytunnel, be sure to remove the fruits from the plants keeping a section of the stem attached. Fruits with a section of stem attached will last longer than those cut off right at the base. Try to leave at least 2 inches of stem. Try to harvest before the frost penetrates your polytunnel, as fruits that have been subjected to frost will not tend to store as well. Keep the squash dry and do not harvest wet fruits. When choosing which pumpkins and squash to keep and which to eat right away (or use to decorate for Halloween), check them over carefully and be sure to use any which have signs of damage first as these will tend not to keep as well as fruits which are in perfect condition. The good news is that while you can consider making some more elaborate preserves, you do not have to in order to enjoy pumpkins and squash over a long time period. A simple process of curing is usually enough to allow you to keep your produce over the winter. Not all squash need to be cured in this way, but many will store better if you undertake this process. Curing is simply a matter of keeping the fruits at a warm temperature with good ventilation and air flow for ten days to two weeks. This process allows excess water to leave the fruit, concentrating the natural sugars and making them taste sweeter. Getting rid of this excess water also slows the fruit’s rate of respiration, reducing chances of rot and helping them last longer in store. The skin on your winter squash or pumpkins will become harder, which means they will resist rot and stay fresher for longer. 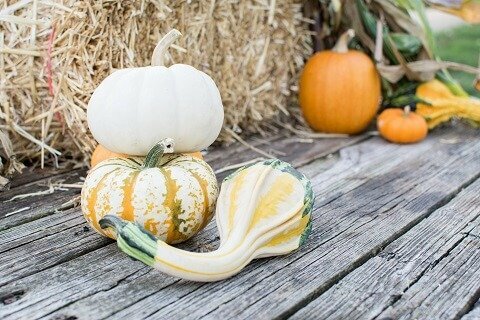 How long your winter squash or pumpkins will store will depend on which varieties you have grown. In some cases, such as butternut squash, you can keep them in store for up to six months. Pumpkins can generally be stored for around three months and may also keep for up to six. After curing, winter squash and pumpkins should be stored in a cool, dry location. Temperatures should ideally be around 10-12 Celsius and no higher than 15 degrees. Humidity should be kept as low as possible, since a high humidity environment can promote rot. How and where do you store produce grown in your polytunnel? Let us know in the comments below.